So, we had some new folks join our team this month, and were shocked to receive business cards and encouragement to use LinkedIn. Why should this be so odd? I’ve given it a lot of thought, and I think it’s a disconnect between the traditional way business has been done in the last thirty years and the rise of social media. Take a manufacturing company like Westinghouse – they manufacture appliances and electrical devices, and 90% of the company is inward-facing. To mean, factory workers, manager, analysts, engineers, human resource personnel, security guards, and administrators spend their entire focus at work on their workplace, and very little time, effort, or attention is given to anyone that exists outside their walls – even if it’s other companies or individuals interested in their brand or products. They have a select number of account managers or sales personnel that might go to the occasional conference, broker deals with distributors or wholesalers or vendors, but maybe 1% of the company is paying attention to what happens outside the company. This kind of structure made sense in the 50’s, when faxes were sent on that oily paper and business cards where the staple of executives and managers. But now everyone can have an account on LinkedIn and represent their company, CEOs tweet updates to the world, and business cards can be ordered for $50. There is a need for human beings to communicate with other human beings, not logos or monolithic office complexes – we remember Steve Jobs, Peter Jackson – we even might remember John Chen of Blackberry, or Chuck Runyon or Dave Mortenson of Anytime Fitness, because they are charismatic, quirky, refreshingly honest, funny, or just damn smart. And while these are top-tier examples, we remember the customer service rep who went the extra distance, or the IT support person with the distinctive voice, or the friendly delivery person who dropped off your courier package. It’s only natural for us to form connections with the people around us (as long as we take the time to put down our smart phones). 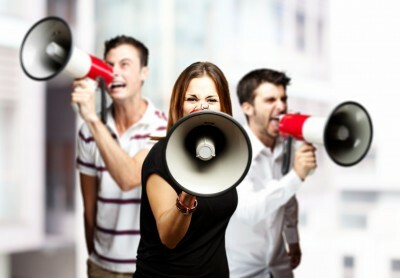 If we can encourage and support our employees, team members, and co-workers to be passionate about their brands, and make even a little ‘noise’ about what they do and how they do it, people will be encouraged and interested in your company, and they may buy from you, or they might mention it to someone they know – but it surely can’t hurt. For our personal case, we are a collection agency based in Canada – and we’ve seen unprecedented growth in the last four years, mostly because the team shares the responsibilities of outward facing communication – some of it is ‘sales’ in the traditional sense, some of it is being a point of contact, and some of it is posting and sharing articles on LinkedIn or Twitter. In the last year, 274 clients have joined us, and collectively with existing clients have listed over 150,000 collection accounts to us, all without a dedicated ‘sales manager’. I think our success proves I’m not crazy – trust me, spend a few hundred dollars, and buy all your employees business cards. Encourage work time use of LinkedIn. Send them to conferences and trade shows. Let them be the ambassadors of your company, and collectively work together to grow. Internally, people will feel valued and trusted, which is never a bad thing – externally, many voices will make your company seem dynamic and vibrant. It probably is dynamic and vibrant, but 1% of your team can’t pass that message along to everyone. If you want to talk about employee empowerment, communication or social media, I’m happy to chat at any point. Feel free to drop me an email or call.